A historic meeting between US President Barack Obama and Cuban President Raul Castro concluded in an awkward moment of epic proportions with Obama’s arm left dangling limply after Castro appeared to knock back a hug from the American leader. The two leaders were concluding a press conference, where they announced the signing of several agreements to increase cooperation and economic investment between the two countries, when the cringeworthy moment occurred. Obama is the first US President to visit Cuba in 88 years and all eyes and cameras were on the two men addressed the media. The powerful photo opportunity was tainted as a result of some kind of misunderstanding - and makes for some hilarious viewing. 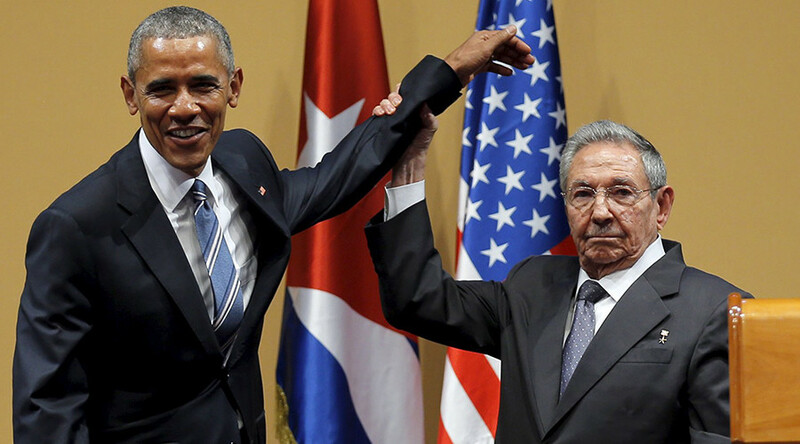 It appears Obama was going for a hug when Castro caught his arm and hoisted it like a boxing referee confirming a fighter’s victory. Both leaders brushed off the incident with a smile as they left the room.